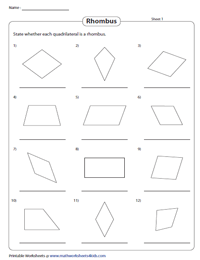 This collection of rhombus worksheets is packed with a multitude of topics such as identifying a rhombus, finding the side length, diagonals, area and perimeter of a rhombus with measures provided as whole numbers, decimals, fractions and algebraic expressions. Incorporate the charts on the properties of a rhombus and practice exercises on the angles of a rhombus as well to enhance the knowledge of middle school students. 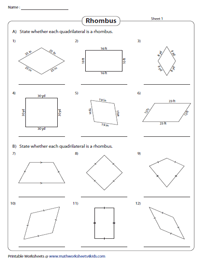 These printable charts vividly state the properties of a rhombus involving sides, diagonals and angles. A thorough knowledge of the properties helps 6th-grade students differentiate a rhombus from the other shapes. The dimensions of the quadrilaterals are provided in Part A and the congruent parts are provided as a hint in Part B. Analyze each quadrilateral and state which of the quadrilaterals are rhombuses. 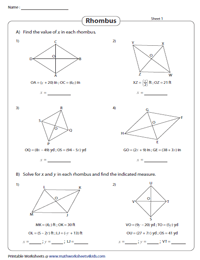 Level up with this set of worksheets on identifying rhombuses, where the congruent properties are not indicated. Use a ruler or trust your eyes to identify which of the quadrilaterals are rhombuses. 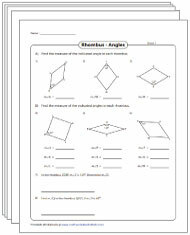 The two-part worksheets help bolster skills in solving algebraic expressions given as the measures of the rhombus. Set up the equation in Part A and solve for 'x'. Part B requires students to solve for two variables 'x' and 'y'. Equate the sides of the rhombus given as algebraic expressions. 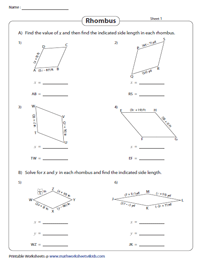 Solve the equation to obtain the value of 'x' to determine the measure of the indicated side in this cluster of worksheets recommended for grade 7 and 8 students. The diagonals bisect each other at the point of intersection. The length of one-half of the diagonal is provided as an algebraic expression. Form an equation, and solve for x in Part A and in Part B solve for x and y. 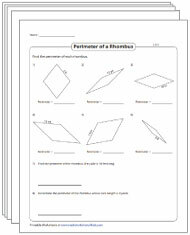 Enrich your knowledge in finding the perimeter of a rhombus with this compilation of perimeter worksheets involving integer, decimal and fractional dimensions. The problems are presented as geometrical shapes and in word format. Learn to find the missing side as well. 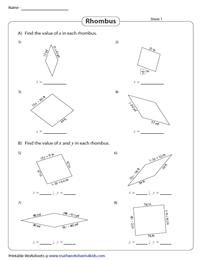 Packed with adequate skills, the area of a rhombus worksheets comprise finding the area of a rhombus with dimensions presented as integers, decimals and fractions involving unit conversions. Use the area to find the length of the diagonal as well. 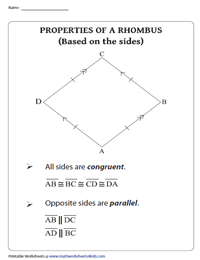 This unit of angles in a rhombus worksheets contains exercises like finding the indicated vertex angle, the angle of the diagonal, solve for 'x' to find the angles and a lot more.